This kind of “CHALLENGE QUILT” is called a fabric challenge. The quilter is to come up with a quilt including the selected fabric (or fabrics) in a recognizable way. In another type of quilt challenge the quilters may be given a theme, like fall or a historic event, around which to create their quilts. Other quilt challenges require the quilter to use a common quilting block, like log cabin or flying geese. Challenge quilters create innovative quilts based on a common theme or specific criteria, often including a size limitation. All of these challenge quilts were on display in the “QUILTS IN BLOOM” show last September. A quarter yard of the fabric displayed here was purchased by each quilter a year before the quilts were shown. The size limitation was 24 inches. 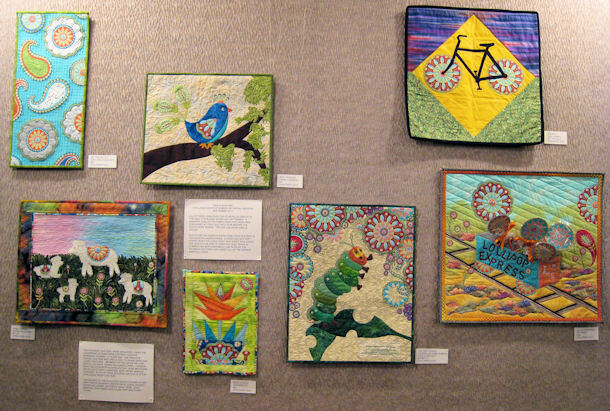 Quilts for the Olbrich Show come from quilters in the greater Madison area. 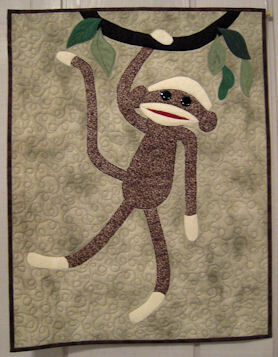 During 2002 an every-other-year challenge quilt “MINI SHOW” was added. The “QUILTS IN BLOOM” Flower and Quilt Show at Olbrich has been assembled and hung by the Thursday quilters for almost all of the show’s nineteen years. The Thursday quilters were organized under the leadership of their newly retired teacher Rosemary Schmidt 17 years ago. The group of eleven quilters meet regularly to share ideas and learn together. Members of the group include; Bertie Lou Davis, Donna Willadsen, Carol J Hanson, Mary Ann Aylesworth, Carolyn Cain, Janis Browning, Becki Kurtz, Mary Larscheid, Mary Meier, Marilee Gardner. 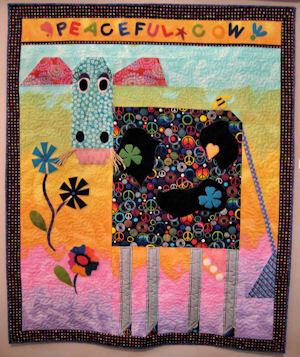 Four of these quilters had quilts in the challenge show this year. The makers of the challenge quilts on display are: Mary Ann Aylesworth, Bertie Davis, Carol Hanson, Donna Willadsen, Gini Riker, Nancy Dorl, Jean Morton, Ginny Mash, Mary Alice Hart and Candy Flynn.